What ever happened to a well-known arms merchant, whose name regularly filled the pages of newspapers in the mid-nineties? The director of the joint-stock company RDP Group weathered ten years of ups and downs, and she now feels that a career change is overdue. PRIOR TO HER REBIRTH as an entrepreneur, Viktorie Hradská (59) worked for 16 years at the Institute for Philosophy and Sociology of the Academy of Sciences. She made translations from Hungarian, and she wrote many plays, the most famous of which is “Commedia finita”, which deals with the life of the opera vocalist Ema Destinová. After 1989 she worked as an internal consultant at the Office of the Czech Government and as a deputy minister for the Committee for International Relations. 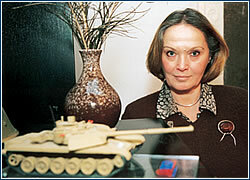 Her contacts in the government and those acquired during her foreign travels contributed to her being selected as general director of a group, which brought together 39 Czech arms manufacturers. “My assignment was clear,” Hradská says about her mission in RDP Group. “I was to create a group of entities interested in the field and to open doors to foreign markets for our arms exporters.” She now admits that this was a utopian vision that she was able to implement only with great difficulty, as individual arms manufacturers were focused more on their individual interests than on the group’s. Additionally, the competitors, especially Omnipol, complained that her firm was receiving advantages from the then interior minister Ruml, who gave RDP Group an order to sell off the surplus military arsenal. “I have no personal ties with Minister Ruml. Our job was to find the ministry a buyer, for which we received five percent of the sale price,” explains Hradská. Last year was a very bad one for her. She was afflicted with a long-term illness, and in the wake of the terrorist attacks of 11 September 2001, some major markets became closed to RDP Group. However, Hradská believes that the company’s economic situation will improve, thanks to such events as last year’s NATO summit. She points out that doing business in the arms industry is very difficult for a woman. “If I were merely some man’s assistant, I would probably not encounter so many problems. I want to be an equal partner, and so I often face misunderstanding,” Hradská notes, adding that she set a ten year deadline for her engagement in business which expires next year. “I am looking forward to return to publishing and translating activities soon, remaining in the arms industry only as a member of a board of directors,” she says.